Several journalists from over a dozen African countries took part in the regional workshop organised by the UN which took place in Algiers. The workshop focused on the role of the media in the fight against poverty and desertification. The initiative was primiarly organised by the UN Convention on the Fight against Desertification (UNCFD). During the workshop, the Regional Coordinator of the Convention, M. Cisse Boubakar, called on the media to use their role to influenc policy makers in African countries on the living conditions experienced throughout the continent. Mr Boubakar found that journalists can play a mediators role between the public and the policy makers. He expressed regret about the negative impact of development policies in various African countries where people still continue to suffer, especially those living in the desert regions of sub-Saharan Africa. 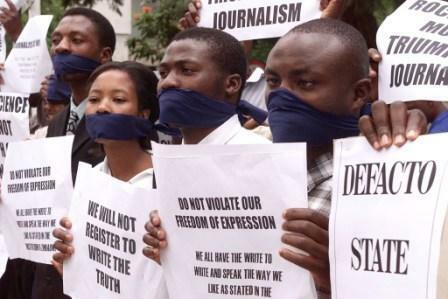 The natural mediating role journalists play becomes more difficult to achieve in a continent which lacks democratic values, governmental criticism and free debate. At this workshop the participants have experienced fully the bitter reality of freedom of expression in Africa. For journalists who play a full role in development, it is necessary that government plans are open to all critical debate and analysis. Several participants complained about the current perception of policy makers, including the fact that the media is only one transmission medium of choice and decision and not a channel for debate and positive exchange. Journalists who attended the workshop called for the establishment of a network of African journalists specializing in the sensitive issues of sustainable development. This initiative is intended, also, to help develop the African continent and to implement the recommendations of the UN Millenium Goals. According to statistics from the African Development Bank (ADB), agriculture in the countries of the African continent, contributes 80% to GDP and 80% of the population live in rural areas and farming is the main activity of the people especially in sub-Saharan countries. The United Nations Convention on Action against Desertification was adopted in Paris in 1994 and ratified by 191 States.